I was going through a folder in which I put all my outfit photos in the last year, and came across several photos that were yet to be published, barely edited. The dress I wore in the pictures was one of my favorite light dresses, with black cat prints all over it. Since I'm still deciding what to wear for New Year's eve, I'll show you these instead. Speaking of New Year's eve, I remember last year I spent the last hours of 2010 having barbecue party with my best friends. Initially there were only eight of us but more people started coming over, it was crazy. We even decided to jump to another barbecue another friend was hosting, mostly my old friends were there so we got the chance to catch up and rekindled neglected relationships that have been blooming until now. Anyway, these pics seem like they were taken months ago when I was still so in love with pastel hues. Now I'm more into something bolder, more statement-making. you look lovely. nice outfit!!! I love the dress! Cute post, thanks for your comment! You're cute :) love the bag. You look great in this outfit. Your dress is absolutely perfect and your hat is very nice. 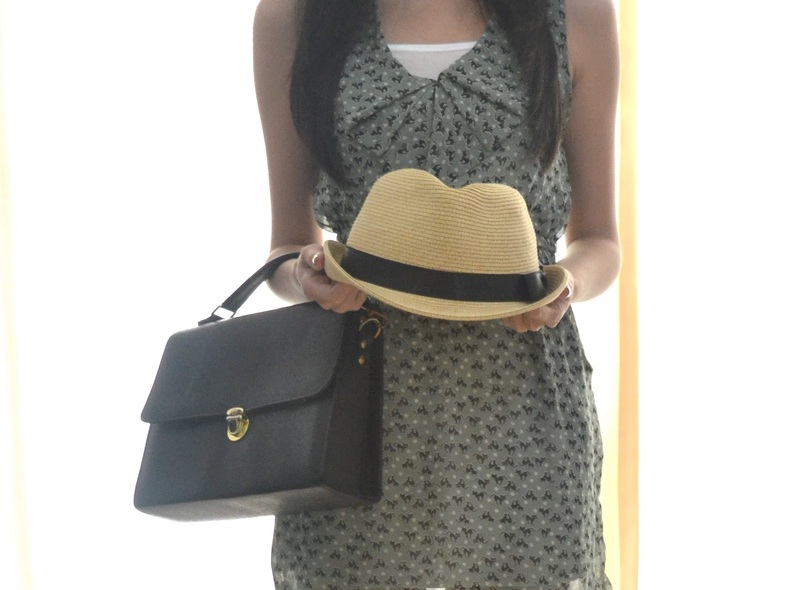 Cute hat and bag. Great accessories to match a cute dress. Thanks for your comment! thank you so much for visited my blog and leave such a lovely comment. I miss the summer. Love those shoes! super cute! this lovely outfit is making me miss summer down here! Cute outfit! The hat is briliant! Beautiful outfit, thank you so much for letting me know about your blog, I am now following you and can't wait to see more!! Love your dress, the pattern is adorable. it's funny I will take outfit pictures then forget to post them. wow, you look amazing! thanks for the comment! You look super adorable! love the hat! Love the print on the dress! Hope you have a fab New Years this year too! you look beautiful! Anw thanks for your comment it's really nice of you. have a great day! What a great outfit! Looks so comfortable and stylish. The hat pulls it together. Awesome! Oh what a lovely outfit, the dress and shoes are so pretty! very chic from head to toe! BEautiful outfit!! Love everything!! You look gorgeous! Happy New Year! I like your cat print dress and you combined it very nice! You have the perfect face for hats and I really love hats. Most time I wear hats in fall or winter season.